KLIM’s newest luggage addition is the versatile Wolverine. Packing intense cargo capacity into a carry-on sized rolling bag, the Wolverine will deliver KLIM’s gear-bag toughness and style wherever it rolls. 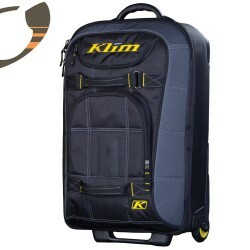 KLIM’s newest luggage addition is the versatile Wolverine. Packing intense cargo capacity into a carry-on sized rolling bag, the Wolverine will deliver KLIM’s gear-bag toughness and style wherever it rolls. High-function travel features include an EVA molded base with integrated corner armor, plentiful internal and external pocket choices, lightweight sturdy extendable pull handle and YKK® heavy duty zippers throughout.